Anonymous sale, Sotheby's New York, 9 January 1990, lot 364. 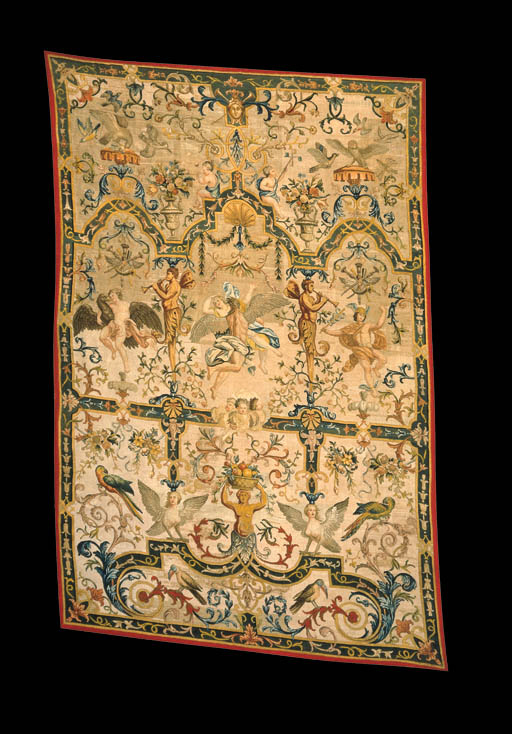 This remarkable embroidery exemplifies the theatrical exuberance of late 17th Century French design and relates closely to the work of Jean Bérain (1637-1711) who in 1674 was made architecte dessinateur de la Chambre et du Cabinet du Roi. Many elements of the design recur in Bérain's engravings (many of which were published in 1711 in Oeuvre de Jean Bérain, recueillies par les soins du sieur Thuret), in particular the strapwork dividers, the use of mythical figures and winged herms and the architectural canopied framework. The three-level divisions and placement of figures in the present embroidery may refer to the front, center and back stages of the theatre which would have been natural for Bérain who also provided designs for festivities and theatricals for the court. A very similar hanging, presumably from the same workshop, was offered Sotheby's London, 13 December 1991, lot 36.